Welcome! I am excited to participate in the collaboration blog hop between Technique Tuesday and My Sweet Petunia! We are all sharing projects using these products. Stay tuned as there are prizes up for grabs! 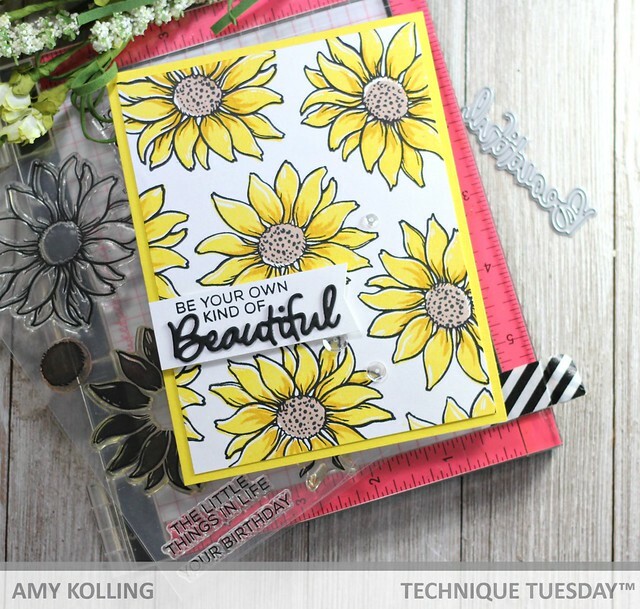 I used the Enjoy Flower Layered Stamp Set from Technique Tuesday because of it's layering possibilities. The Misti Stamping Tool is perfect for a stamp set like this! I have lots of photos to share so let's get started. I started off with a panel of cardstock and stamped the solid image in a bright yellow ink (all inks from Altenew unless specified). Using my Misti, I added the shading layer with a darker color of the same shade of ink. The Misti makes for perfect even stamping especially when you need to add more color as I did here with my shading layer. One layer was too light so I was easily able to restamp to make darker using my Misti! Next, I've added the centers with brown ink and then black dots for the centers. These flower just come alive with the layers! Now, this panel is really pretty the way it is but let's take it up another notch! Using the OUTLINE stamp, stamp it using black ink (I used VersaFine Clair Nocturne) for a bold effect. I show how here how the flowers each look before I filled in the rest of the panel. 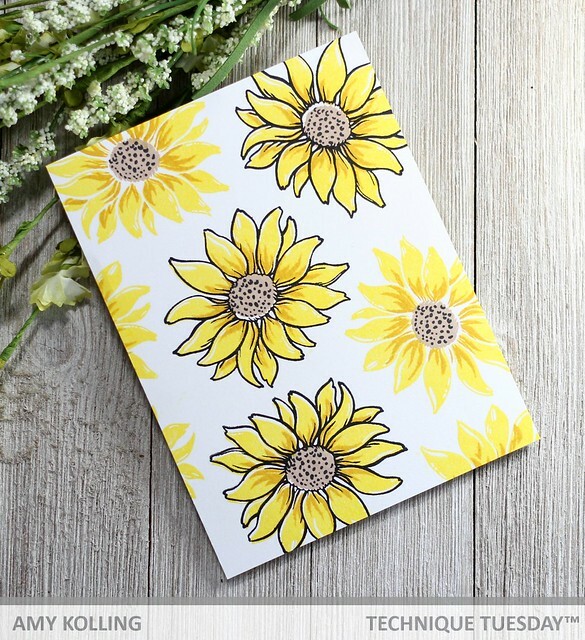 Once the panel was all stamped, the panel was trimmed down and added to the same yellow color cardstock (Sunshine from MFT) which was then added to a top folding white notecard. To finish, the sentiment (from Cherry Blossoms Stamp Set) was stamped onto a white strip and the 'Beautiful' diecut was added below. The sentiment strip was hand trimmed into a banner end and adhered with foam adhesive. Here is the finished card! 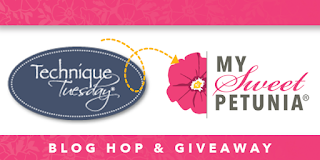 Comment until Monday, May 29th 11:59 PM CST on both of the Technique Tesuday and My Sweet Petunia blogs for your chance to win! Now take a look at everyone else on the hop! Beautiful yellow flowers so fresh and bright! I love all things daisy and daisy-like. The MISTI makes layered stamps so painless and love the way you can get everything so perfect. Thanks for sharing this gorgeous project! Such a summery card! I love the layering you can do in the misti! Love how we both used the same stamp set, but the colors you choose can really change-up the bloom ... your overall stamping is perfection. Beautiful card. Love the Sun flowers. Love this sunny card. Your daisies are so happy. Such a cheerful card! Thanks for sharing. The colors in this card make me so happy! It is beautiful. I think this is such a cheery card! Love it! Just gorgeous! Bright, bold, and beautiful!!! love your flowers! very pretty card! Oh my your card is its own kind of beautiful ! The sunflowers are an absolute ray of joy and cheer! Such a stunning card. My mom's favorite flowers are sunflowers, and this reminds me of her. That’s a very beautiful card, very sunny !! I loved your flowers. Thanks for sharing your technique! Gorgeous card! If you could deliver sunshine in a card, this would be it. Love it! Your card is beautiful and very happy ! I love your card with this bright yellow. Its funny how the color you use really can change the look. Love your happy card! You made a great background. Gorgeous card! Love how bright and cheerful it is. Fantastic card! LOVE the yellow daisies!! thanks for the inspiration. 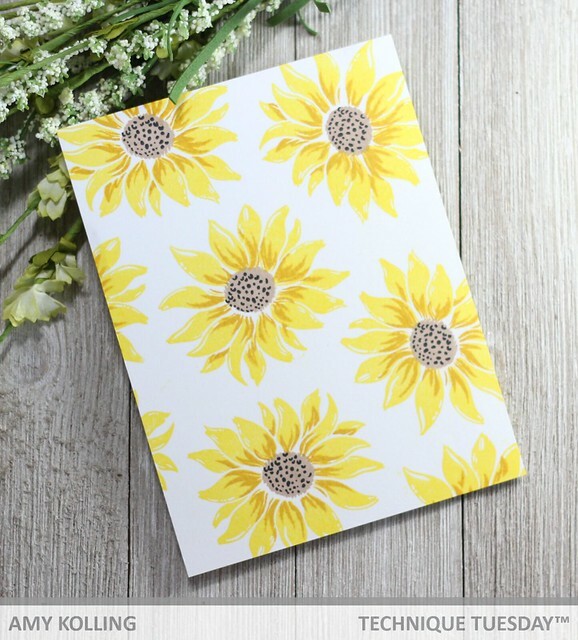 Sunflowers make for such a happy, cheery card! Beautiful job. Reminds me of my vacation in france where they have fields and fields of sunflowers. 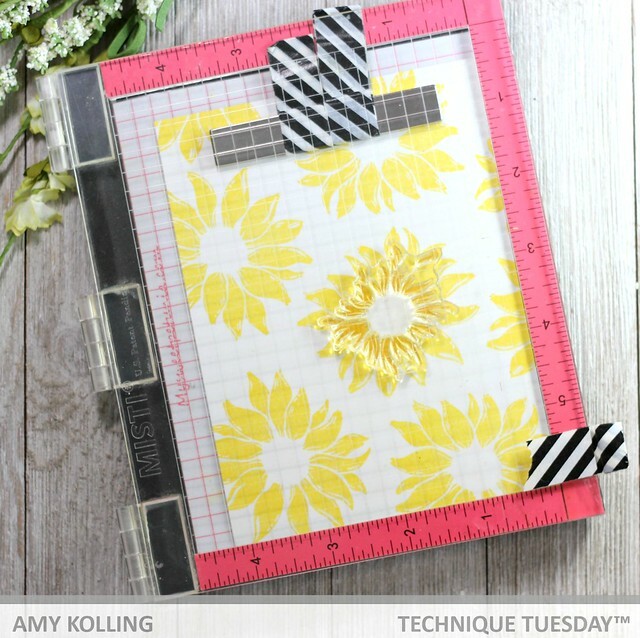 Amy, that is gorgeous and bright card!!! Beautiful card--love the great flowers. Wow! Your card is totally gorgeous!!! I'm totally in love for the amazing colors!!! Your card is beautiful! I love layered stamps! Beautiful!! 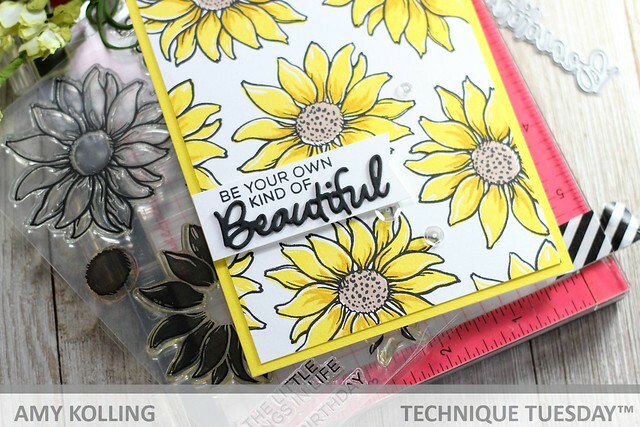 I love the detail in these fabulous layering stamps and the colors you chose are perfect! There's something about yellow and black together that is so pretty. The daisies are lovely and I love the font on the Beautiful sentiment! Love those pretty flowers! 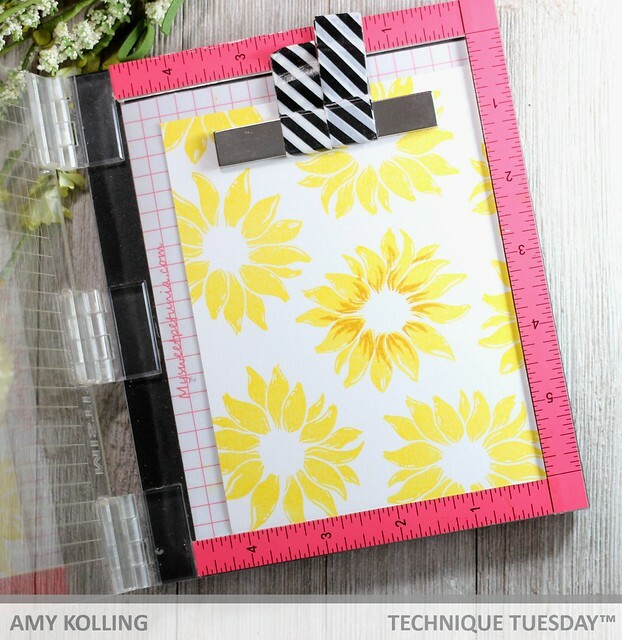 The MISTI is a great tool to use with layering stamps! Your sunflowers are a Ray of sunshine! Love sunflowers! Thanks for the chance to win and sharing. Gorgeous flowers! The stamping is perfect! Love this! I love layered stamps too, and you did yours beautifully. I appreciate that you took pictures both before and after adding the outline, because it's such a different look, that it almost has to be seen to be believed. Thanks for sharing your lovely design and techniques with us! WOW! Your card just pops off the page! It's awesome :) Thanks for sharing! Your card truly makes this set shine. Thanks for sharing your inspiration. Hello Bluebird / More May Release!